This 3/4-inch Silver Plated Serenity Prayer Medal with Prayer on back can only be purchased in these bulk lots of 25 units at a discounted wholesale price, which is now available to the public. These discounted bulk packs offer the perfect solution if you want to give these Catholic goods away as gifts or to use as free envangelizing tools. Imported from Italy. This 3/4-inch Silver Plated Archangel Raphael Medal with Prayer on back can only be purchased in these bulk lots of 25 units at a discounted wholesale price, which is now available to the public. These discounted bulk packs offer the perfect solution if you want to give these Catholic goods away as gifts or to use as free envangelizing tools. Imported from Italy. Our Green Laminated Scapular 6-Pack features 6 units for one low price. 2" Green Scapular with Instruction Pamphlet that is sealed in a soft Plastic Case. Our Confirmation Key Chain 3-Pack features 3 units for one low price. 4" Holy Spirit Key Chain. Get 100 pieces for one low bulk price with our 100-Pack of Our Lady Of Guadalupe Holy Card. Only available in this bulk pack. Our Lady of GUADALUPE HOLY CARD 2" X 4" Paper Holy Card with gold edges. Pack of 100 holy cards, blank back. Get 100 pieces for one low bulk price with our 100-Pack of St Francis Prayer For Peace Holy Card. Only available in this bulk pack. Prayer of Saint Francis of Assisi 2"x4" Gold Embossed Italian Holy Card with Prayer 100 Per Pack. In time of need, run your fingers along the simple chain; grasp the medal and breathe. By simply focusing our attention on taking a breath and linking that breath to God, we can dispel chaos and go back to our spiritual roots. Gold dipped stainless steel 6 1/2″ chain with a 1 cm Benedictine medal. Our My Saint My Hero logo charm on a 1″ drop chain allows the bracelet to be adjustable. Breathe Chain Bracelet comes with an inspirational card. 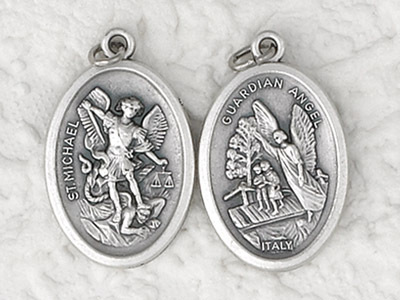 This 25-Pack - Pendant-GUARDIAN ANGEL/StMICHAEL has passed our quality control assessment and meets our strict criteria to be a Catholic Shop product. Buy with confidence. Catholic Shop aims to carry the finest products on the market. Our staff has inspected and tested this 25-Pack - Pendant-GUARDIAN ANGEL/StMICHAEL and found it to be worthy of our Satisfaction Guarantee.